The North West Active Travel Network runs occasional seminars and site visits at minimum cost to share good practice in promoting walking and cycling around the region. Inner ring roads can be intimidating for pedestrians, acting as a barrier to walking into town centres from neighbouring areas. One-way streets and limited access discourage cycling into such centres. Parking on pavements means that people with pushchairs, wheelchairs or mobility scooters often are forced to use the carriageway. It can be difficult to find solutions that suit everyone. 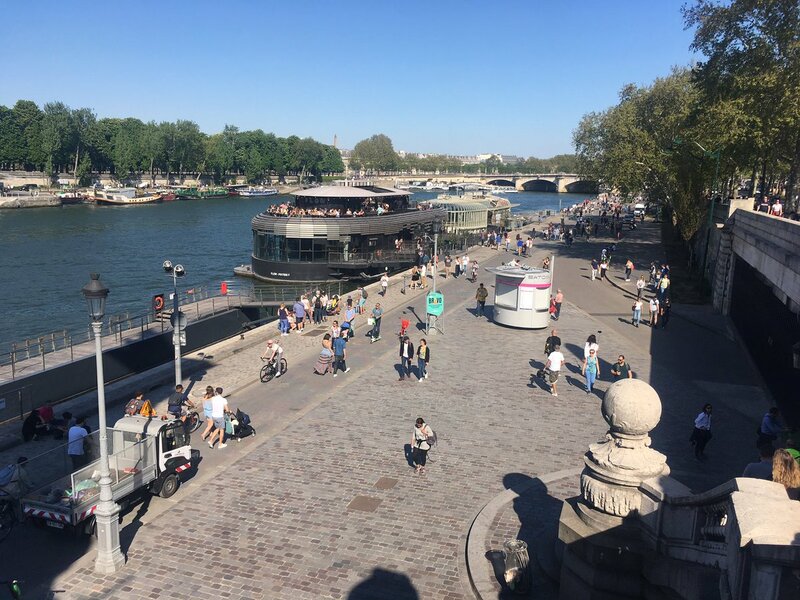 Improving access to town centres by bike and foot is one way of reconnecting them to their surrounding areas and ensuring their survival. 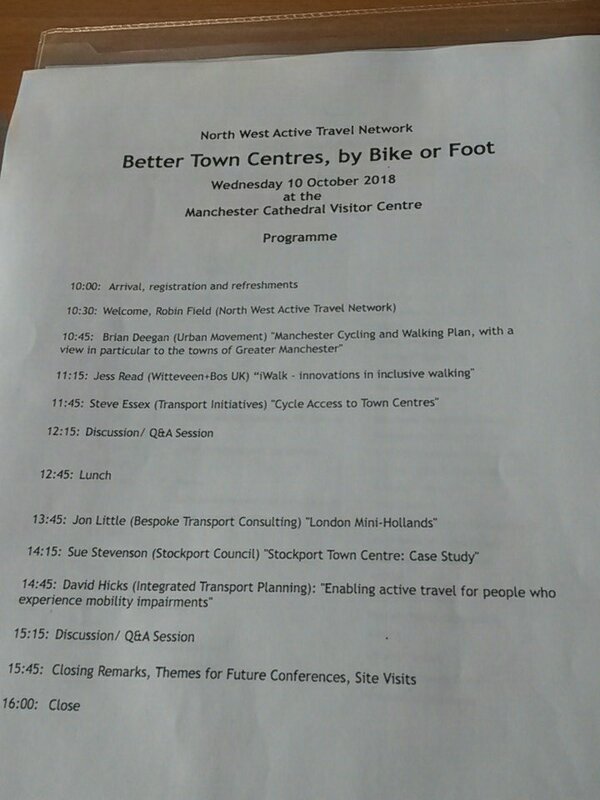 The North West Active Travel Network hosted a highly informative seminar on walking and cycling in town centres, bringing transport planners, activists and academics to Manchester on 10 October. The day was divided into two sessions. 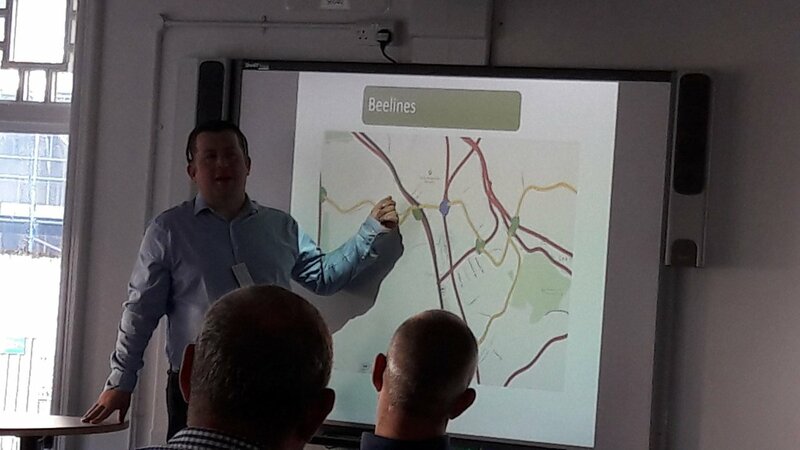 Brian Deegan from Urban Movement produced a spirited start to the seminar, describing the work of the Greater Manchester(GM) Beelines Team creating a comprehensive walking and cycling network across the conurbation. Brian contrasted the Beelines approach where local authorities and communities have been engaged from the outset of network design with the development of Cycle Superhighways in London where the Mayor has greater powers to direct local transport strategy. Brian took us through the process of hosting network planning meetings in each of the ten GM boroughs with council officials, local residents and cycling activists. This involves identification of physical barriers to walking and cycling – such as fast roads with heavy traffic – on maps with marker pens. 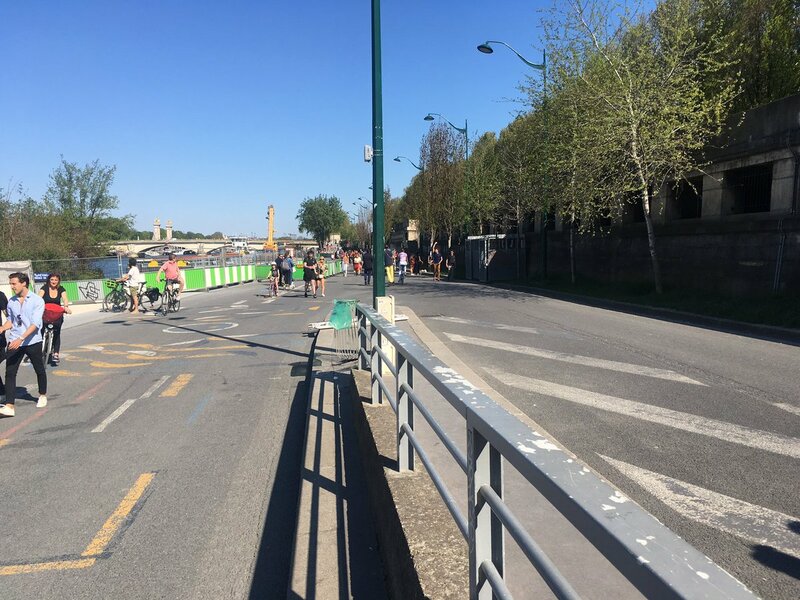 These barriers may be overcome with crossing points acting as way markers on Beelines taking advantage of existing quiet and slow traffic streets. This input has been added to the Project Mapping website where the public have been invited to comment on the online map. The information will now be used to produce further refinement of the Beeline network. Brian talked about the importance of specifying minimum quality standards and introducing filtered neighbourhoods in each authority. The Beelines Team are working with councils in their planning processes for future big projects to ensure they are compatible with Beelines aspirations. Designs for the new bus station in Stockport may now feature improved connections for cyclists to the railway station and nearby Beelines. 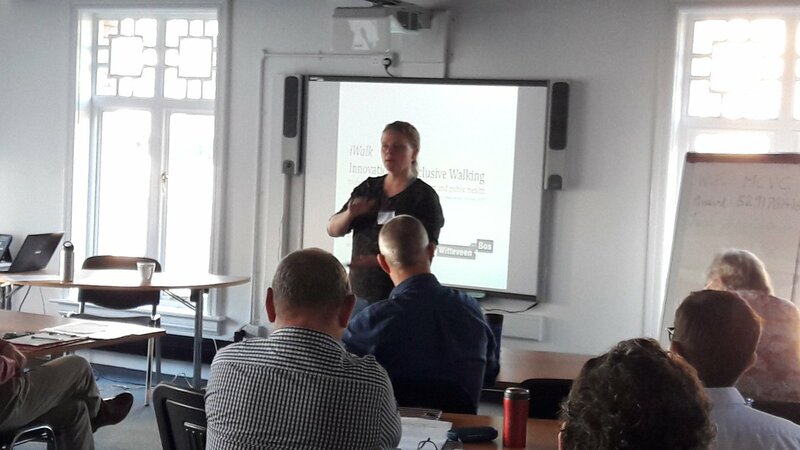 Jess Read from Witteveen+Bos UK stressed the importance of walking for health but noted that levels of walking are at an historic low in England. Meanwhile the number of car and vans has trebled in 40 years. Jess contrasted this situation with conurbations such as Copenhagen and Freiburg which have implemented successful strategies to increase walking. Jess noted these cities have a distinct advantage over their British counterparts, able to raise local income tax to fund improvements. Jess claimed the number one determinate of walking is good infrastructure. 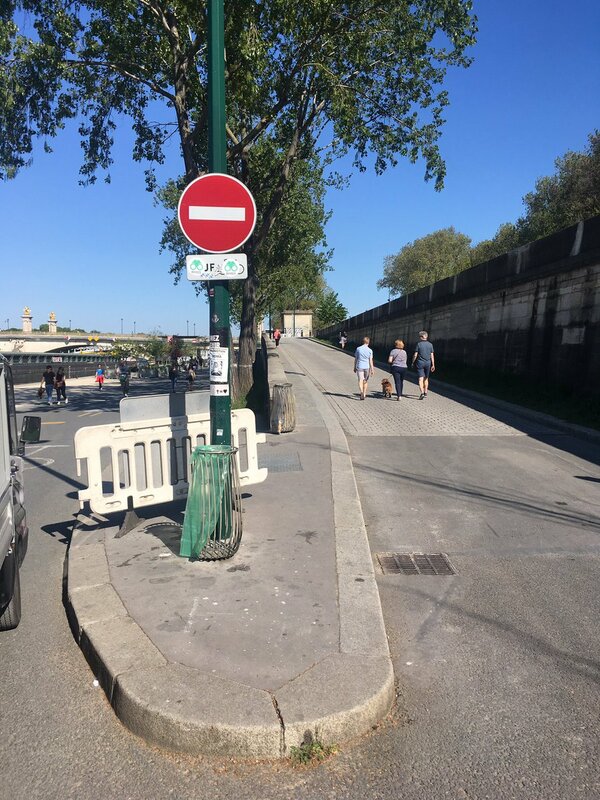 Pavement parking can significantly reduce the width of the walkable pavement which needs to be at least 2.5 metres wide to facilitate two people walking together (for example a parent and child). Infrastructure and enforcement powers are needed to keep motor vehicles away from pedestrian space. Jess argued the treatment of surfaces is vital to make walking feel safer. At the moment, most pavements in Britain are the same colour as the road surface, making them seem a part of the roadway and therefore a legitimate space for parking. Rounding off the first session was Steve Essex from Transport Initiatives describing cycle access to town centres. 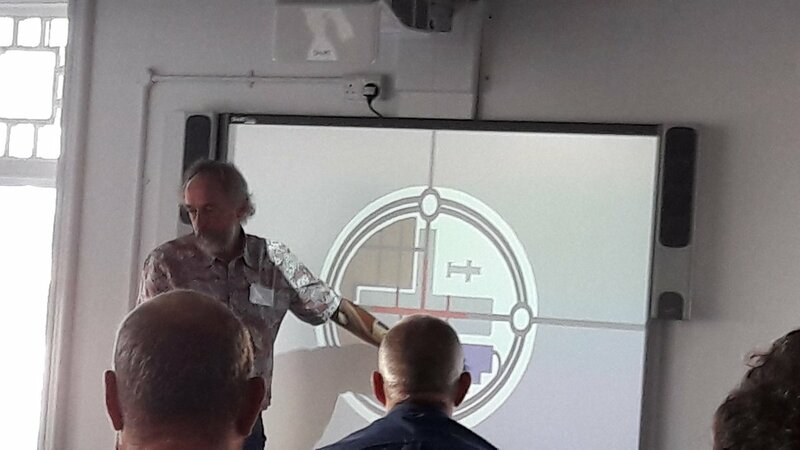 Steve presented a model of town and transport planning in Britain that has been typically applied to medium and large towns with Southampton used as an exemplar. Towns have cut themselves off from their surrounding areas by installing ring roads – a process that continues to this day. Such planning creates bland, unattractive areas in the urban realm. Much of town centre space has been re-purposed for car parking. It is useful to see pedestrianisation schemes in that context, as provision for ‘residual’ walking, for the last leg of a journey between car and retail outlet. Pedestrianisation schemes have at best made cycling more difficult by funnelling those on foot and bike into narrow streets or at worst have banned cycling altogether. A ‘feedback’ loop has been created, whereby increased provision for cars has increased car usage in town centres, thus necessitating more car parking. 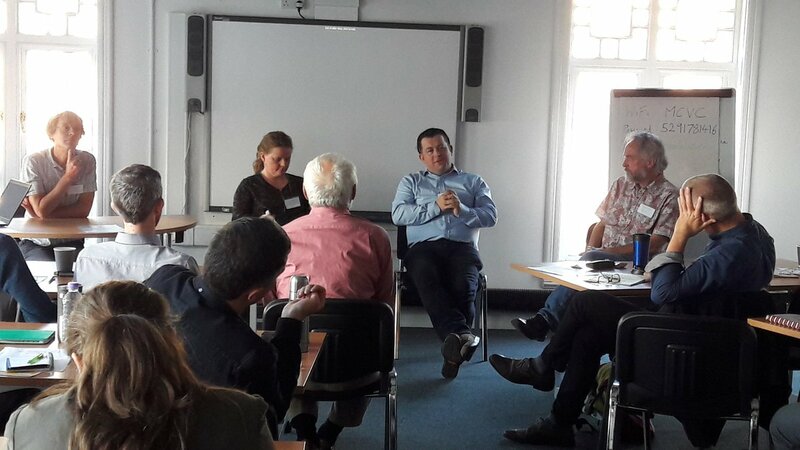 After lunch, the seminar heard from Jon Little of Bespoke Transport Consulting on the Waltham Forest ‘Mini-Holland’. Jon explained the outer London borough had a car-dependent culture and massive problem with poor health related to lack of exercise. The plan was to create a network of routes, serving everyone in the borough, not just commuters on longer trips. The poorer part of the borough, Walthamstow was used as a rat run to avoid congested roads. The aim of the project was to make Walthamstow completely porous for walking and cycling and non-porous for cars, through a range of measures, including filtered permeability, street furniture instillation and surface treatments. Jon emphasised the importance of community engagement in designing the infrastructure, particularly as the project needed to overcome a vocal campaign by a minority resisting any restrictions to car use. Sue Stevenson from Stockport Council spoke about how smaller and medium-sized towns can improve walking and cycling facilities in the context of tight budgets and competition for retail footfall. Active travel will be an important part of Stockport’s Whole Town Plan. Currently only 2.1% of journeys are made by bike and 8% by foot, which is similar to the GM average but needs improving. Finally, David Hicks of Integrated Transport Planning detailed his research into active travel for people with impaired mobility in the Netherlands, UK and Canada. 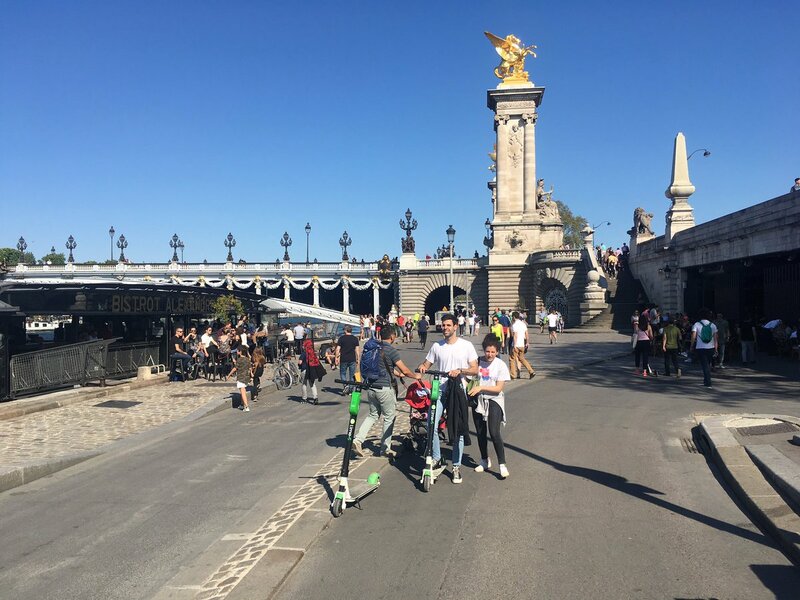 He found that those using personal mobility vehicles (such as electric wheelchairs) do so at a higher speed in the Netherlands with its good walking and cycling infrastructure. David argued that these positive developments in the Netherlands should be borne in mind when promoting and designing walking and cycling infrastructure in the UK. This stimulating seminar highlighted the many challenges to improving walking and cycling in towns while showcasing examples of significant improvements that have been made or are being planned.